Sweet potato pie with organic cinnamon. Old-fashioned apple crisp. Sound like food you'd want for dinner? That's how Baby Gourmet makes all of their baby food. All of their products start out in Jen's and Jill's own kitchens—not in a lab or a factory. Jill makes sure their recipes are filled with only the best, freshest, organic, kosher ingredients from around the world. 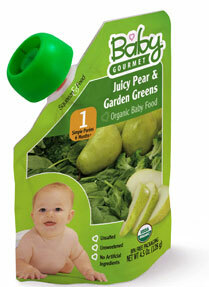 Baby Gourmet takes the hassle out of eating on the go. The slim pouch slips neatly in your bag and lets you squeeze food right onto a spoon. When wee ones aren't quite so little anymore, they love feeding themselves straight from the package. Baby Gourmet was kind enough to send me a sampling of their products. My baby girl (11.5 months) gobbled them up! I loved the convenience of taking them on the go and knowing she was getting fruits & veggies with quality, organic ingredients. As soon as I pulled one out, she immediately begin reaching for it and bouncing excitedly! They have also generously offered to send one lucky winner a pack with all 9 of their fruit & veggie pouches! Enter to win: Click here to enter. Entries open until Saturday, February 11th, 2012, at 10pm. The full line-up of Baby gourmet products can be found at your local Walmart! Or.................... head to Amazon.com and save 35% with Baby Gourmet delivered right to your door. Order as much as you like, as often as you like! But hurry. Special offer is available until Feb 29, 2012.